Last week, after a 45-month siege and bombardment by regime forces, the Damascus suburb of Darayya finally surrendered. 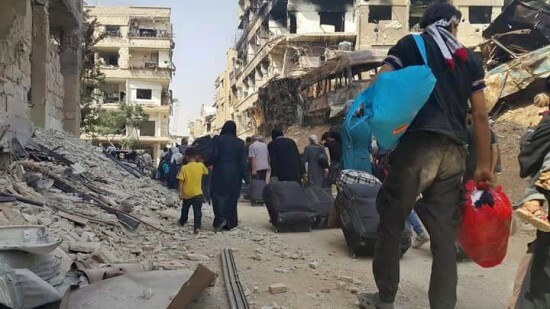 About 5,000 civilians were moved — some to nearby regime-held towns, some — along with several hundred rebels and their families — to opposition-held Idlib Province in northwest Syria. I left a jug of water dripping on a plant that I took care of for four years. I saved the plant from under the rubble of a house bombed by the regime. I cared for it until it became green again. Every day, I would tell it “Good morning”, as though it were a close friend. When I went, I left it with what water I could, so that it stays alive, in the hope I will return before it dries out and shrivels. I have a great hope of returning to my city and driving out those who occupied it. I don’t have anything from here to take with me. There’s just the grave of my friend, that’s the only thing I could say goodbye to. I thought perhaps I’ll take a handful of earth or the wooden sign that I placed as proof of his burial site. I went to the graveyard to say goodbye to him. I couldn’t keep myself from crying. Their souls and graves are precious to us; it hurts to leave them behind. We promised them that we would stay together, and here we are leaving. The dead will remain alone in Darayya. When I left in the first group, we were in a hurry. I left some livestock behind that I was raising, and some chickens. They were locked inside and I remembered them just before the bus started moving. I asked one of the fighters standing nearby to free them, so they could live on what grows in the ground. I wouldn’t leave them without anybody to take care of them. They are living souls. I believe it deep inside. After we’ve gone, God won’t forget anybody. In his mercy, he will take care of them. What’s important is that I do my duty towards these souls. I never believed that I would leave Darayya one day. Our revolution was different from that in other parts of Syria. We tasted destruction while life outside was normal. The rebels in Darayya only had light weapons. There wasn’t much ammunition, anti-tank, or anti-aircraft munitions. We weren’t as strong as the regime. The lack of weapons made it hard to withstand. We were short on food, eating one meal a day. The situation in the liberated areas [elsewhere in Syria] was different, they controlled larger areas and had greater numbers and more ammunition. On the road, I felt a mixture of sadness and joy. I was disappointed with the factions in the south, who didn’t come to our aid. I was happy to meet the fighters in the north. With many tears, and with great sadness for the blood of my friends and loved ones, which watered the earth of Darayya. And with the hope that we will come back, victorious. I still don’t believe what’s happened. I saw our house on the road out of Darayya, after four years. It was still standing. It hasn’t been damaged, a palace against the scale of destruction and rubble. But I wished it had been destroyed, so that nobody but me could tamper with its memory. Umm Mayas is a widowed mother of two children: Mayas, 7, and Muadh, 4. Her husband, a Free Syrian fighter, was killed by a barrel bombing in 2013. She is currently in a reception center with her children in Harjaleh, a regime-held town about 12 km (7.5 miles) southeast of Darayya. She says she will stay in Harjaleh because she has nowhere else to go. 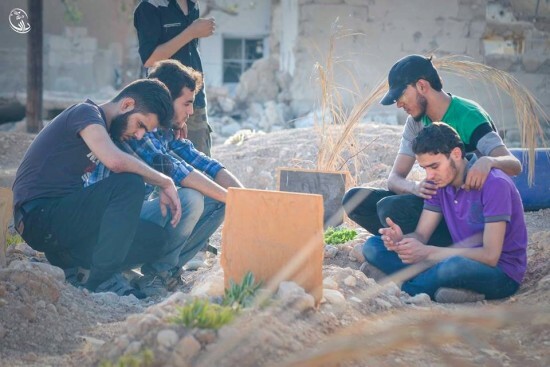 Before I left Darayya, I went to the grave of my husband—my two children and I—and I kissed it. I told him: You will remain in Darayya, which you shed your blood and gave your life for. I’m leaving, because of the evacuation agreement, the bombing, the hunger. But you’ve stayed, which proves your love for Darayya, for its soil. Alongside many of my neighbors, I burnt my furniture, so the regime won’t steal and sell it. I only took my children’s clothing, some suitcases. I cried bitterly while burning my furniture, because I was leaving my town, where I was born. And I wished I had died before this day. My daughter, Mayas, was taking her doll. But when I told her we wouldn’t return to Darayya, she left the doll in the house, telling it: Stay at home where it’s safe. 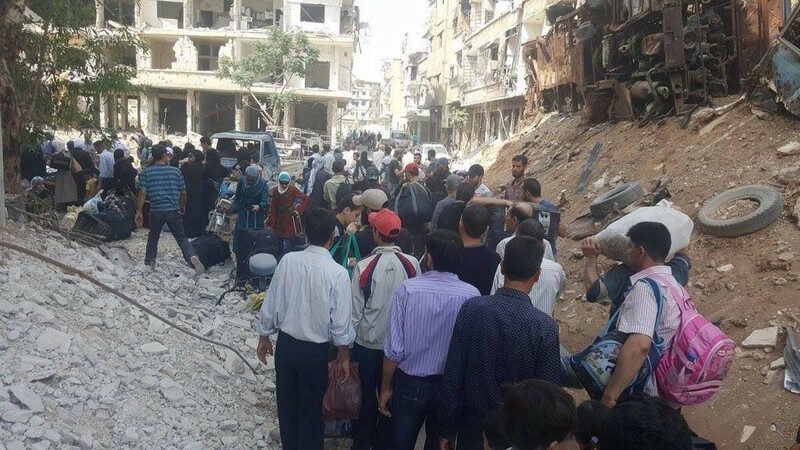 There won’t be barrel bombings or missiles on Darayya, protect it from the strangers. I started crying then, with my whole heart, because my daughter is really attached to her doll, and she left it to protect Darayya. When we got to the center, which is a single room, the children were given some biscuits, chocolate and ice cream. My son was looking at them with amazement! The children were asking us about these foods, asking us what they were made of. In Darayya, we were eating one meal a day, soup. The children said to me: This food is delicious. Why didn’t you give it to us in Darayya? My son Muadh is four years old. Since Darayya was blockaded, he hasn’t seen these foods. And even Mayas, she’d forgotten their taste. It wasn’t just my children, all the children from Darayya reacted like mine. If you saw my children’s joy at this taste, then the whole world would know how the children in Darayya were living. We spent most of our time in the [bomb] shelter, deprived of everything, even the sweetness that is available to most children in the world. That first night, we felt safe. We slept without fear of the bombings. When I left Darayya, I kissed the walls of my home. I was convinced that I wouldn’t be able to see them again. 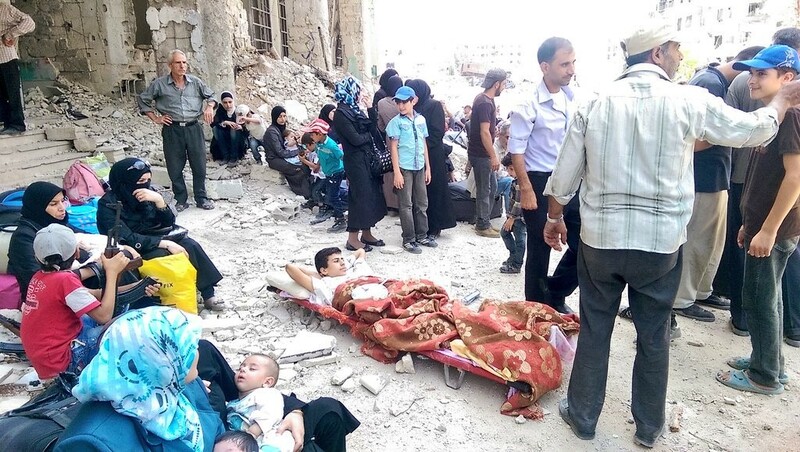 All of the factions have abandoned the people of Darayya. Fighting for themselves; they didn’t help us. We surrendered to the regime and accepted its conditions. Sadness and defeat consume me because I left Darayya, but what consoles me is seeing my children happy, eating some of the foods they’ve never known. I hope that the war will stop and we will live in peace. We’re tired of war and hunger. We’re tired of bombing, death and loss. Don’t our children deserve to live like those in the rest of the world? But it’s fated for our children to die. War deprived them of their right to feel safe and secure. It deprived them of all their rights to education, and even to eat until they are full.